People like to call John Pawson the "father of Minimalism" in British architecture. Since really coming on the scene in 1986 with the design for the London apartment of his then girlfriend, art dealer Hester van Royen, Pawson has certainly earned the label with his rigorously uncluttered, light-flooded rooms in which everyday appliances such as light switches, door handles and books disappear behind gleaming white panels. His style stands out for its linear stringency, for its focus on consistently eschewing all non-essential objects and all decoration. The current retrospective at the London Design Museum dedicated to the work of the now 61-year-old, seems anything other than minimalist, however. On the top floor of the building on London's South Bank, models, groundplans, photos and videos all vie for attention. 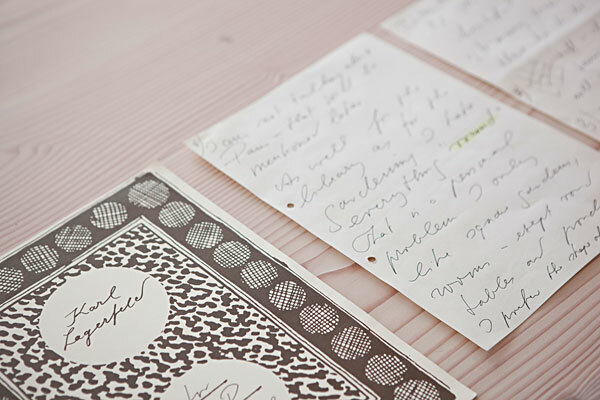 Books and documents are arranged on a 13-meter-long table made of Douglas fir by Denmark's Dinesen - here an issue of his aesthetic manifesto of 1996, the best-selling "Minimum", there a letter from Karl Lagerfeld, in which he explains to Pawson that for personal reasons he cannot stand round rooms. At first sight, all these bits and pieces seem surprising. However, it swiftly becomes apparent that in this case the wish was to visualize the work processes won out over the ideal of noble emptiness. Special attention is paid to the processes that led to the construction of the Cistercian monastery in Nový Dvůr in the Czech Republic. 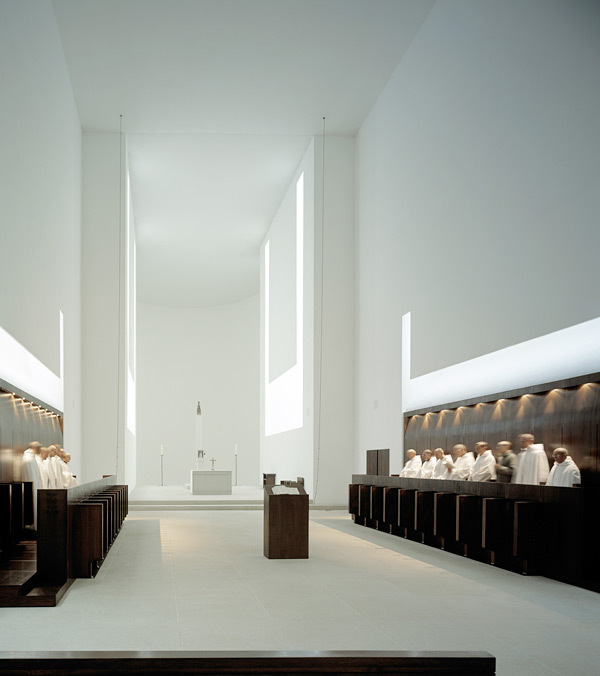 The monastic order there was looking for the right architect to design their new monastery and came across pictures of Pawson's Calvin Klein Flagship Store in New York and evidently found much of the spirit of St. Benedict in the restraint of shapes there, in the architectural transcendence of form, as it were. 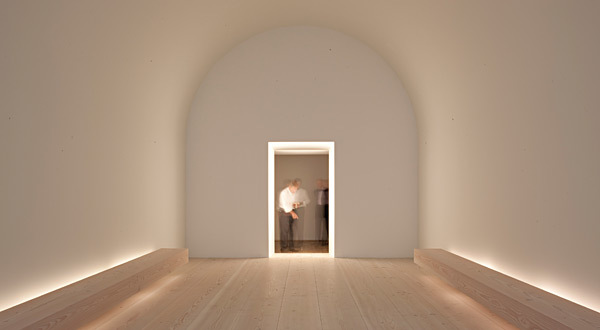 Pawson's secular architecture at times has an almost religious mood, as can be seen from the room that John Pawson designed specially for the exhibition and has placed at its heart: Beneath a barrel vault, high white walls rise up on both sides of the entrance; the floor boards are Douglas fir from Dinesen, which has been working with John Pawson for years now, as are the two long benches flanking the room, each cut from a single piece of wood. It is a room with no other purpose than to make pure space tangible. 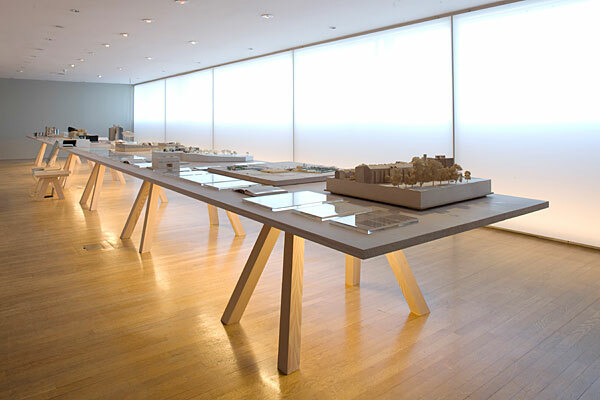 Alexander Menden: Mr Pawson, why do you believe the time has now come for such an extensive retrospective of your work? 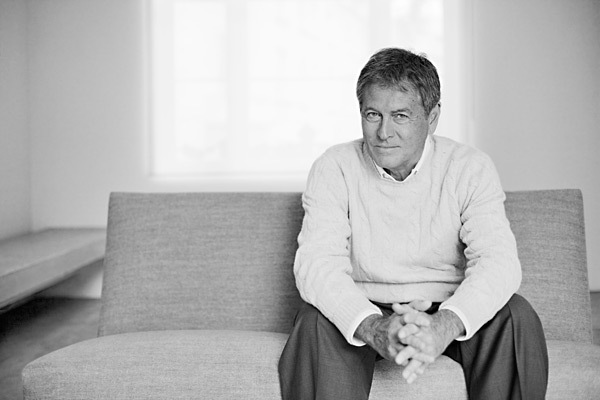 John Pawson: To be honest, I would have responded far more enthusiastically if I had been offered the opportunity ten years ago. I would have seen it as a chance to show what I do and, above all, what I had planned for the future. When my friend Deyan Sudjic asked me at the end of last year whether I wanted to design the show, I had mixed feelings. Architecture shows are very difficult as you first of all do not present the works but only models, plans, etc. I proposed jokingly that for the price of the entrance ticket the visitors could take a budget flight and visit the monastery in the Czech Republic, and that would be far more insightful for them. Secondly, people who do not like my style should likewise find something in the show of interest to them - such as how the design process unfolds, and that I do not work on my own, but that each project is a team effort by hundreds of people. You distinguish between plain "building" and "architecture". Could you explain the distinction perhaps? Pawson: What I mean is that when confronted by real architecture you can see that someone spent a long time thinking about the concept and you can sense that when you enter a room - you feel good in architecture. That's the way I want to construct things: People should feel good in my buildings. I need to be careful with the notion of the "architect", as I am not officially registered as an architect in England. That professional label is protected and I never registered as an architect. AT the end of the day, it's a question of semantics, however. In addition to the feelgood factor you mention, you also seek to create rooms in which "certain activities seem natural". Does that mean that you always design the rooms with a series of activities in mind that are to be performed in them? Pawson: Exactly. If I talk about a project with my colleagues in the office then I find myself repeatedly reminding them that they should place themselves in certain situations: For example, what would it feel like to clean your teeth in this room, to open this door, etc. Some people think that I design something and then force people to adapt to the design. But the opposite is true: I focus entirely on the person who will live and use the building. But don't you have to be very disciplined to keep these rooms clean and their free surfaces uncluttered? Disorder, books and clothes lying around, wouldn't they rob the rooms of much of their effect? Pawson: I believe you need discipline to commission such rooms and to see the construction project through to conclusion. It is without doubt not simple to furnish or decorate rooms, but I think living in them is pretty easy. I myself am terribly undisciplined, that's why I love orderly rooms so much. Of course I feel really good if I can, for example, put my house in precisely that orderly state in which I originally imagined it. If I achieve that now and then, well I enjoy it, even if the moment is over only a few minutes later. That's quite alright. The photos illustrate a momentary, but essentially fictitious ideal state. Achieving an ideal state seems to be a constant theme in your life. Is it true you wanted to be a Buddhist monk? Pawson: In the early 1970s things were not going well for me. My father had just told me it would be best if I stopped working for his clothes company. That same week the woman I hoped to marry broke up with me. I had just seen a program on TV about a Buddhist monastery in Japan and thought, quite naively, that I'd go there and would reach a state of complete clarity within a year. A Japanese friend whose father was a monk drove me to the monastery in North Japan and said: "I'll wait in the village for you and if by tomorrow morning you have reconsidered things, I'll drive you back." Needless to say, one night of scrubbing floors and only a bowl of rice was enough for me." Yet in a way you have remained true to the monastic life. 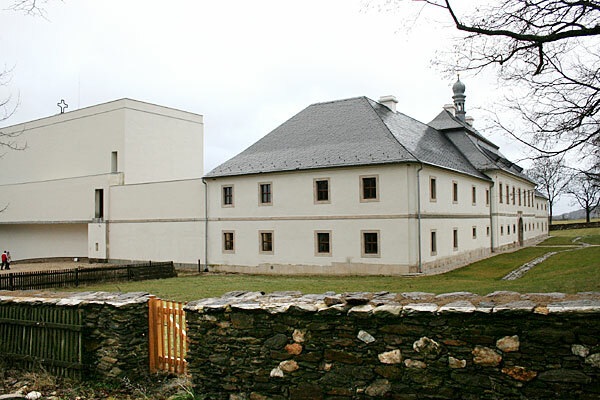 After all, you designed the Cistercian monastery in Nový Dvůr and lived there for a time with the monks. Pawson: I had a pretty exact notion of what the church should look like beforehand - indirect light, no windows, no cross in the apse, but an empty space that fostered meditation. The other designs arose in the course of three years of incredibly intense talks. The monks wanted me to learn about the practical side of their lives, for example that they never leave the monastery. When they first contacted me and said "We have seen your Calvin Klein Flagship Store in New York. Could you design a monastery for us?" I thought they had actually been in New York. That was naturally quite impossible; they had only seen it in a book. 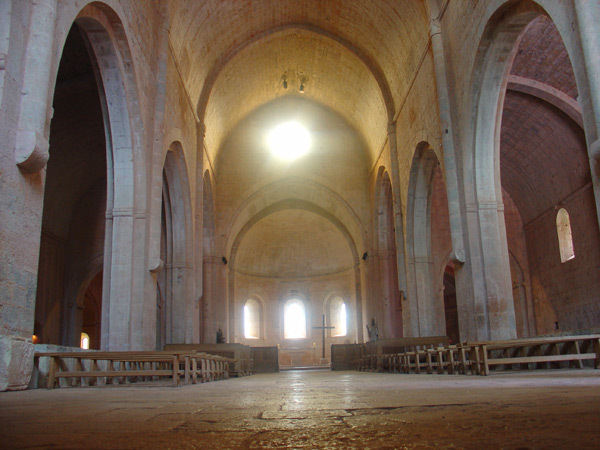 It can't be a coincidence that the religious space of Nový Dvůr resembles the strict Romanesque style of the Medieval monastery of Le Thoronet in Provence. 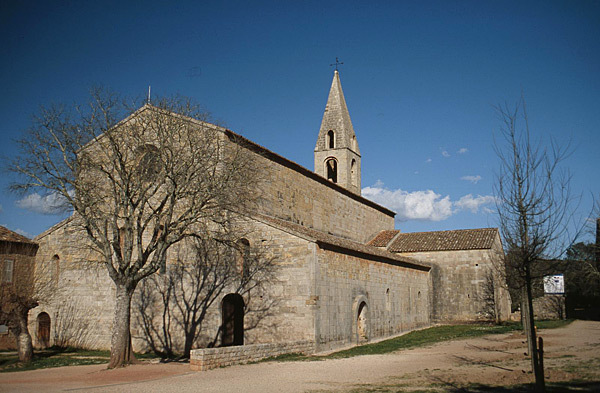 Pawson: If I had to cite one favorite building, then it would be Le Thoronet. The proportions and the light there have influenced me immensely. And it was exactly those aspects that appealed to the monks in my Calvin Klein store. There is no contradiction at all between inviting an architect who has "designed" a store to create a monastery. What counts is that the architect in question knows what is appropriate for the respective building. Japanese architect and designer Shiro Kuramata has also influenced you strongly. What have you learned from him? 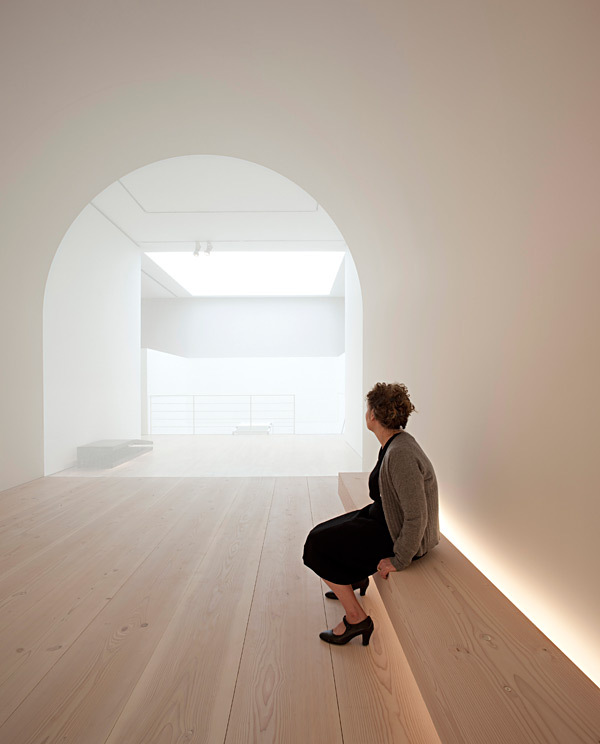 Pawson: I hesitated for a long time before studying architecture and instead hung out in his Tokyo office. He convinced me to approach architecture more systematically. Until then I had considered my interest in the work of Mies van der Rohe or Palladio as a hobby. When I saw Kuramata's work for the first time I realized there was someone realizing what for me had only existed as an idea. We became friends. He once visited me in London; I was having problems with a couple of projects. He looked at them and immediately got to work. Four hours later he was still working away and I nodded off. He was incredibly angry and rammed his elbow between my shoulder blades saying: "Designing is a serious matter!" I have tried to adopt that ethic. People like to call you the "father of Minimalism". Another of your role models, Donald Judd, always rejected the label. Do you accept it? Pawson: I possess neither his energy nor his eloquence. He was very good at describing what he did. "Minimalism" may be misleading as a term, but it is hard to find a better one. In 1996 I published an entire book on the concept, "Minimum". It was very successful for a design book, but I think is was completely misunderstood. People primarily expected nice pictures. It is always dangerous to think in pigeonholes, although I believe that specifically architects like to be categorized as part of a "movement". Tony Fretton, Adam Caruso, Peter St. John, Jonathan Sergison, Stephen Bates and David Adjaye used to always meet on Sundays and read their essays to one another - Peter Cook called them "The Whisperers". She shared a specific philosophy and supported one another. I never had a group like that. You are exhibiting in the old Design Museum London, whose new home you will be designing in the former Commonwealth Institute. What kind of architecture is appropriate for a museum? Pawson: In this case I am having to work with an existing building in Kensington. It's a box, 50 by 50 meter, with a famous steep roof. Together with Deyan Sudjic, my task is to present design in an exciting way. Just as much a challenge as the architecture - at least we aren't exhibiting Picassos, but instead usually everyday objects. The permanent exhibition will be on the top floor with a great view out over Kensington. Then there will be three gallery rooms of different sizes for temporary shows. Hopefully another place where you can feel good.